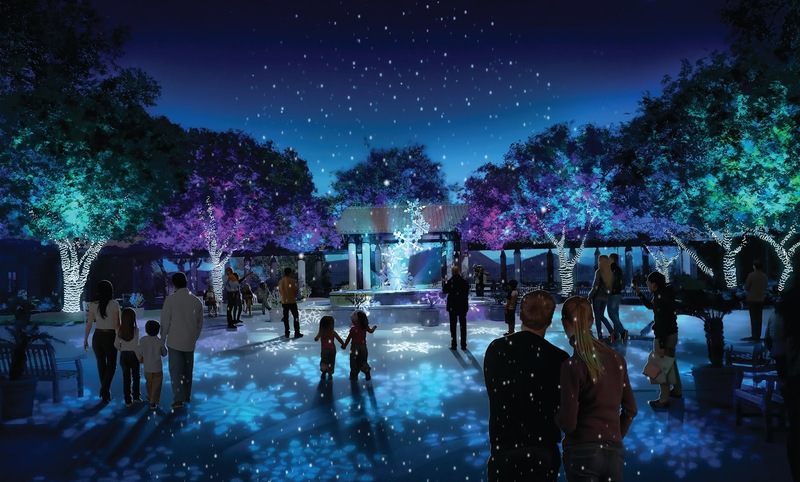 Holiday Lights Debut at the Reagan Library! 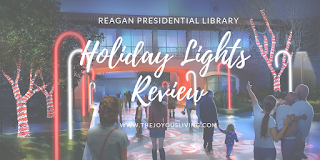 The Great American Christmas: Holiday Lights at the Reagan Library runs nightly from 6:00 p.m. – 10:00 p.m. until December 31, 2018, closed only on December 24, and December 25. As this is an outdoor walking tour, the main Reagan Museum, Air Force One Pavilion and Christmas Tree exhibit will be closed. 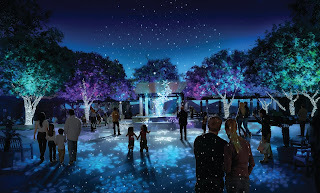 Holiday Lights will operate rain or shine. 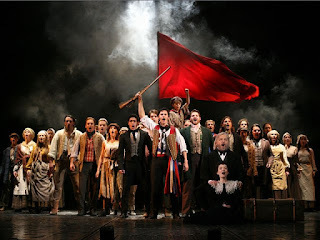 No refunds or exchanges can be made once tickets are purchased. 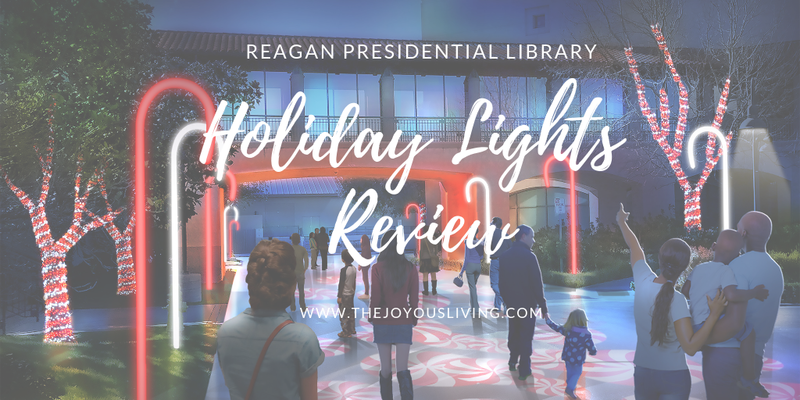 Holiday Lights at the Reagan Library. (c) Reagan Presidential Library. 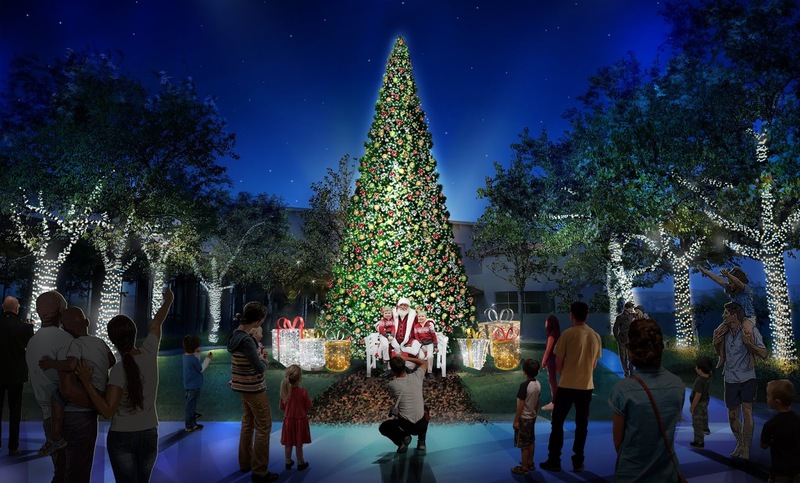 This inaugural not-to-be-missed nighttime holiday event is sure to be a fun time for the entire family. 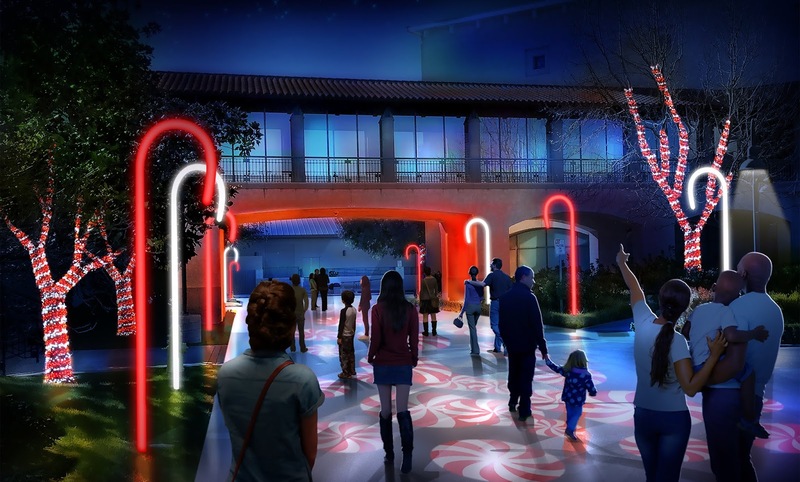 The walk around the Reagan Library campus includes LEDs, lasers, 3D projections, animated displays, interactive photo ops, live musical entertainment (select days/times) and so much more. Capture your holiday memories in a photo with Santa (select days), warm up with hot cocoa and other holiday treats, and more! 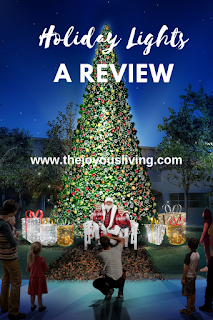 My family and friends and I attended the festive new offering, Holiday Lights, last Thursday when it was raining cats and dogs in Southern California. Thankfully we had made our reservations for 8pm and the rain had stopped an hour earlier so we had the best of both worlds - a cold and brisk evening to get us in the spirit of things and no rain to prevent us from having a jolly good time. It was the perfect evening for some hot chocolate and churros (consider dunking them in your hot cocoa!) while we walked around (well, technically, I was wheeled around by my awesome dad). Holiday music played over the loudspeakers as we walked around the property and friendly docents shivered in the cold (such good hearted souls) and pointed the way to each new exhibit so we never feared for being lost. 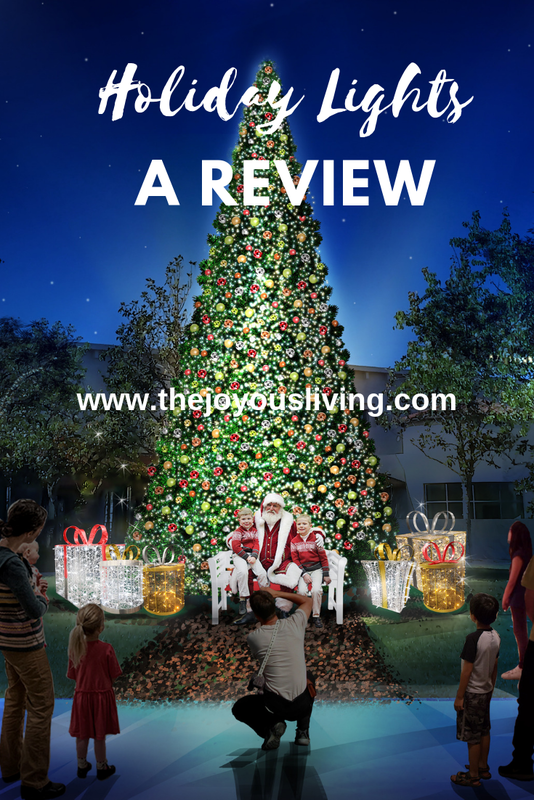 For being the inaugural year for Holiday Lights I thought that The Reagan Presidential Library did a smashing job putting together the exhibits with some beautifully decorated trees when you first arrive, a whimsical display involving a fighter jet, a homage to the late President Reagan, and one of the most gorgeous finales that I dare not spoil it for you! 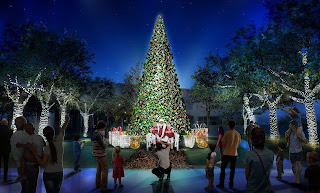 I'm sure with the live entertainment, Santa photos, flurries of "snow" in the courtyard [not happening when it rains] it is even more magical. And just like with the wonderful docents indoors, the nighttime docents were very helpful with tidbits of information and useful directions through the exhibit. My only disappointment was that there did seem to be a few naked spots without lights but I can only hope the exhibit expands year after year because there is so much potential in the grounds of the Library. But truly, I couldn't think of any better way of ushering in the season! Disabled Note: The exhibit is 100% accessible to the disabled as are the indoor museum exhibits. Due to the long walk around and a couple lengthy uphill and downhill climbs, I highly recommend a wheelchair if you are not too strong on your feet. There were no stairs that prevented me from seeing any parts of the exhibit. Santa Pictures at The Reagan Library. (c) The Reagan Library. General parking in the visitor lot (free) will be on a first come, first serve basis. Once the visitor lot is full, docents will be directing guests to park on Presidential Drive as well as off-site parking lots and will provide shuttle service to the main entrance of the Library for ticket purchase/entrance. Tickets may be purchased online or in person at the ticket kiosk for either 6pm or 8pm. If you plan on attending on the weekend or when there is live entertainment, it is recommended that you purchase your tickets in advance. And please remember that the lights happen every night rain or shine and price of admission does not include entrance into the museum. Candy Cane Lane at The Reagan Library. (C) The Reagan Library.